Summer in our household means that Saturday nights are for lobster rolls. It’s the least we can do considering we hardly have dinner out these days as childcare costs eat all of our disposable income—and then some—and Avi’s bedtime is still an early 6:45 p.m on the dot, and sometimes earlier. I often get questions about how we parent, what we do with Avi, what I feed him, and so on. I only do what works for me (us) and this is in no way being prescriptive with things. Families (moms/dads) do what works for them. Period. You like co-sleeping and it’s going swimmingly? Hats off to you, friend. We had to go the CIO method, cold turkey, and while it was horribly stressful at the time, it worked for us in the end. For me, personally, sleep is the Holy Grail. If I get adequate sleep, I do 100 percent better in everything; and if Avi sleeps through the night—meaning he goes to bed on time with his routine of settling down—then many more things fall into place. Everyone wins. We don’t do a crazy number of things. We don’t organize playdates; rather we see friends and if they have kids, great. We don’t take Avi to special classes just yet. I don’t think my parents did it with me at Avi’s age, and I think I turned out okay. We read to him a lot; we play music; we show him lots of things. Avi is a very active toddler, and likes to keep busy and be on the move. Even when we read to him, he refuses to sit down, standing next to me, his hand on my shoulder. This morning, we read Mr. Brown Can Moo, Can You? about ten times while a Bach concerto was softly playing in the background. Avi’s reaction to the flute is to stand really still next to the turntable and hold his breath with his hands suspended midair. We feed Avi what we eat—and when I say that, I mean, we feed him things like chicken korma, which he loves, spices and all. We try to buy organic meat and dairy, but we don’t go crazy with the produce—we do our best and what our income allows. 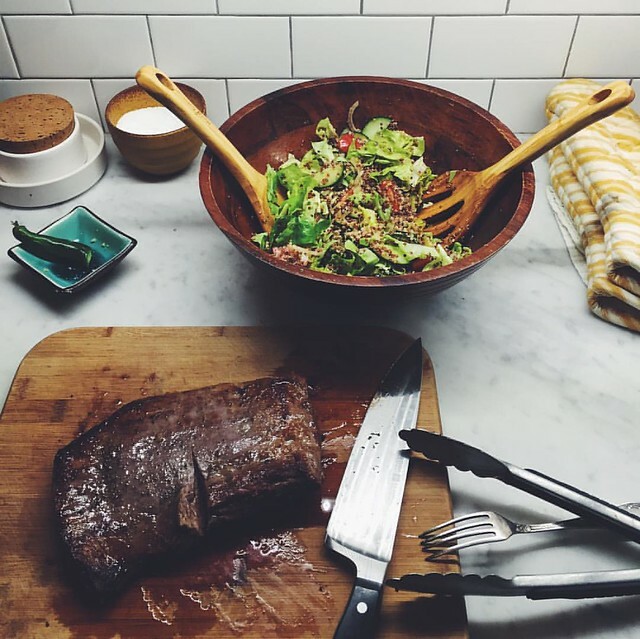 Now that the farmers’ markets are starting to fill up with good produce, we try to get as much there as we can, including some excellent grass-fed beef, which we have once a week, most often in the form of flank steak with bang bang sauce. We give him the leftover steak with a drop of the sauce and he all but inhales it. If this kid could eat meat around the clock, he would. Because Avi is growing up in a bilingual household—during the weekdays he hears mostly Russian, and on the weekend, it’s a mix of Russian and English—he isn’t saying as many words as, I guess, some toddlers his age would. He does know a few, and they’re, oddly enough, English words. He says “shoe”, “baby”, “cat”, “yay” and “yup”,—used differently for different circumstances—and “uh oh”. When he says “baby” it’s a musical “bay-beeeee” with the first syllable at a high pitch, much like you would say “uh oh”. If I ask him where the baby is, he brings me Elmo. Likewise, when I ask him to find Elmo, he will bring me Elmo and then make out with him. The love between the kid and his Muppet. And that’s roughly it. We reserve the word “no” for situations that are dangerous. Like, no means not putting your hands near electric outlets. No means not pulling on Forrest’s tail. But mostly, we try to redirect him and give him an option of what he can—rather than can’t—do, and for now, it seems to work okay for us most of the time. There are definitely moments of defiance and we just work through them. I try not to intellectualize it too much. I learned how to make bang bang sauce from Chef Soulayphet Schwader of the Laotian restaurant Khe-yo in Tribeca. Chef Phet, as he goes by, makes some of my favorite food in the city; spending a day in the kitchen with him a few years ago was a dream come true. In the last week, I’ve struggled a lot with the world at large. I look at Avi and I don’t know how I could ever adequately explain the atrocities that happened in Orlando. Words fail me; I don’t even know where to begin. I hope that Avi grows up knowing that we, as a nation, could do better—and did. I hope for better, more sensible legislation and a more tolerant society. And I hope that no matter what Avi identifies with, whom he loves, whatever religion he is—he finds acceptance and support in his community, and beyond. With those ingredients, you should get roughly ½ cup of the sauce, enough for a steak and maybe even a salad. I never measure the ingredients and always taste, taste, taste. What you’re looking for is a sauce that is bright and acidic from the lime, with an umami salt note from the nam pla, and a healthy burn from the chile (how much you add of the chile is entirely up to you and your preference for spice). I usually add an average size garlic clove, and enough sugar that it balances out the lime and the fish sauce. You don’t want it sweet, but you want the well-rounded note that the sugar will add. And right before serving, you want to drop in a teaspoon or so of finely chopped cilantro leaves. The acid in the sauce will turn the leaves brown if you let it sit overnight, hence you might want to add it just before you serve whatever it is you want to put bang bang sauce on, which, if you’re me, is just about everything. Avi sounds like me as a kid. I ate anything that was put in front of me (unlike my sister who was (and still is) a snacker who prefers cereal and yogurt over a real meal). I’ve versions of this bang bang sauce… I didn’t know it had a name! And yay for using the microplane to grate garlic. It’s my favorite use of it… especially when making sauces or salad dressing. I don’t mean to be nosy, but I’ve missed your blog on the net. I realize that you must be very busy, with work, raising a toddler and running a household. Maybe you’re taking a respite, anyway, hope you will be back full time? Hope you are getting much enjoyment from your adorable Son. This recipe for sauce is amazing!! i will definitely try this recipe..
Hello personal visit our shelter. I loved this artricel.. Bang bang sauce recipe is yummyy !! I love food, people, traveling and thank you for sharing valuable information here. Thank you for sharing these sites bang-bang !!!! Miss reading your blog post! Will you be active back soon? Looks like some delicious sauce. Will give it a try. Thanks.